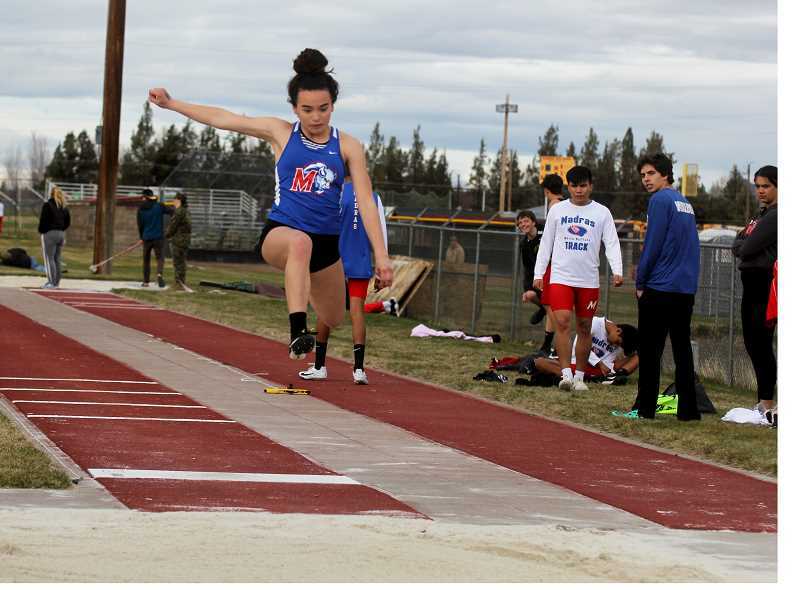 The Madras White Buffalo track team participated in their second track meet of the year April 3. Madras traveled to Redmond High School, facing Summit, Lost River and Redmond. The boys team placed second with 58 team points, while Summit (120 points) claimed gold. Redmond scored 54 points and Lost River ended with 20 points. The girls team took third with 25.5 points, with Summit (140.5), and Redmond (60) at the top. The 2018 100-meter district champion, Olivia Symons, picked up right where she left off. The sophomore won both the 100-meter dash (13.49) and the long jump (16-00.75). Senior Anona Francis placed third in the discus (79-08) and fourth in the shot put (26-02). In the javelin, Lexi Pickle finished in fourth (81-07), and Wynema Wolfe placed fifth (80-06). Freshman Brianna Williams placed fifth in the high jump (4-08), just short of first place finisher Lyndsey Martin, of Redmond, (5-00). For the boys, the 200-meter dash was completely dominated by Madras. Dalton Waldow claimed gold (24.37), and Leo Gutierrez was right behind him for a second-place finish (24.92). Andree Castellanos finished in fourth (25.87) and Max Binning came in fifth (25.87). Donnie Bagley dominated the javelin (139-00) for a first-place finish. Zach Buller, of Lost River, was the closest behind with a throw of 136-06. Bagley also placed fourth in the discus with a throw of 108-06. The White Buffalos did very well in the jumping events with several top placers. Allen Jackson finished second in the high jump (5-08), while Summit jumper Jack Normand placed first (6-04). In the long jump, Treyvon Easterling claimed silver (19-00), while Jackson and Waldow were behind him (18-03.50), for a fourth-place tie. Nathan Rodriguez finished in third place in the triple jump (37-02.50) for the White Buffalos. Gutierrez finished the 400-meter race in second place (55.41), and Omar Diaz placed fourth (56.52). Calvin Kolar, of Summit, barely edged out Gutierrez, placing first with a time of 54.51. Diaz also finished in fifth place in the 100-meter dash (12.03). Binning was able to place second in the 800-meter run with a time of 2:18.84. The freshman was bested by Kaden Barker, of Summit (2:16.24). The 4x400 meter relay team of Diaz, Binning, Rodriguez, and Gutierrez had a time of 3:49.06, placing second behind Summit (3:35.02). 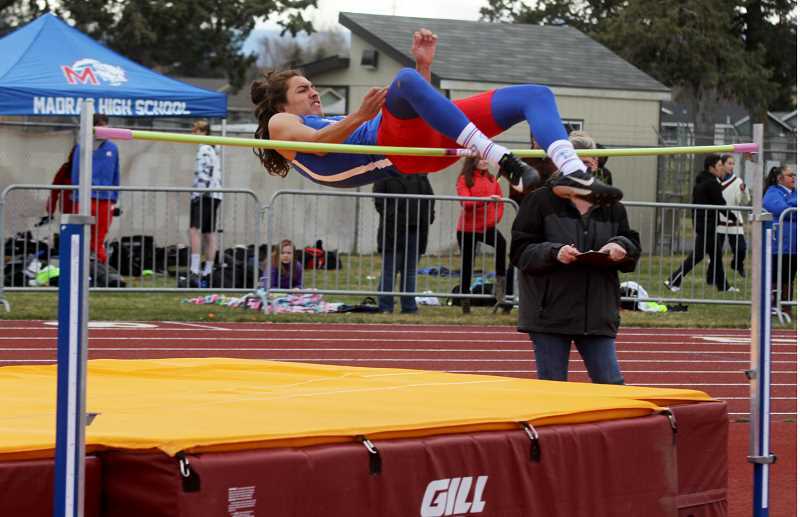 Madras pole vaulter Eric Boynton claimed silver (10-00) for the Buffs, behind both Summit pole vaulters, Nathan Fairbanks, and Forrest Franklin (11-00). 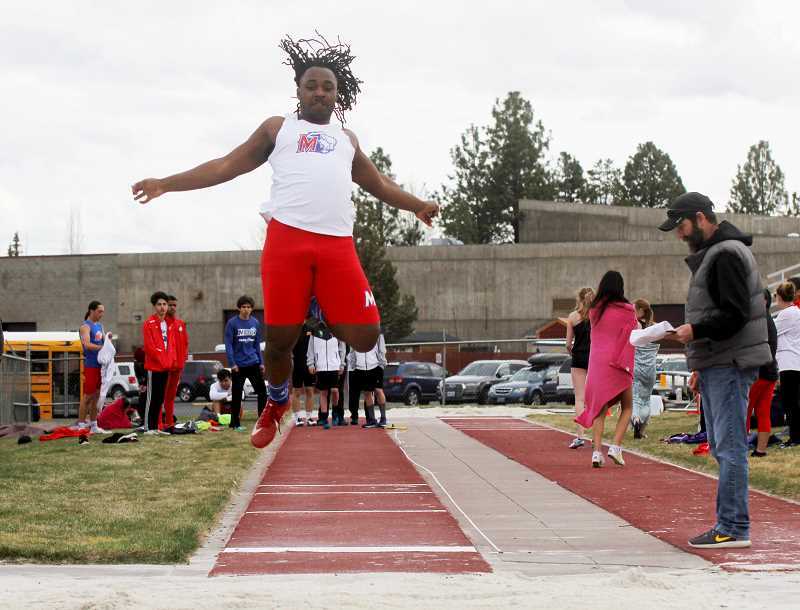 "I think we looked really good considering our start to the season (heavy snowfall)," said head Madras track coach Andrew Jensen. "This is really our first meet. We went to a relay meet a couple weeks ago, which was good, but this was the first time we had some official marks. Overall, I am really happy with where we are at and where we are going." Madras travels to Gladstone Wednesday, April 10, testing their skills against Tri-Valley League opponents for the first time this season. The Buffalos host a track meet Wednesday, April 24.